It is an entirely unremarkable building, except that 42 Lomasney Way is utterly amazing, a vestige of another Boston, a witness to history, a solitary survivor. Once it was part of an unbroken chain, a row of 30 brick walk-ups along the east side of Lowell Street from Causeway to Minot, a matching row behind it, another across the street. There were hundreds like it back then, crammed into the immigrant neighborhood known as Boston’s West End. Now it stands alone, slender and exposed, like a single key left on a battered piano. It is four stories high and three windows wide, unadorned except for its lintels. In place of lost neighbors, billboards have hung on its sides for years, like an orphan in sandwich boards. 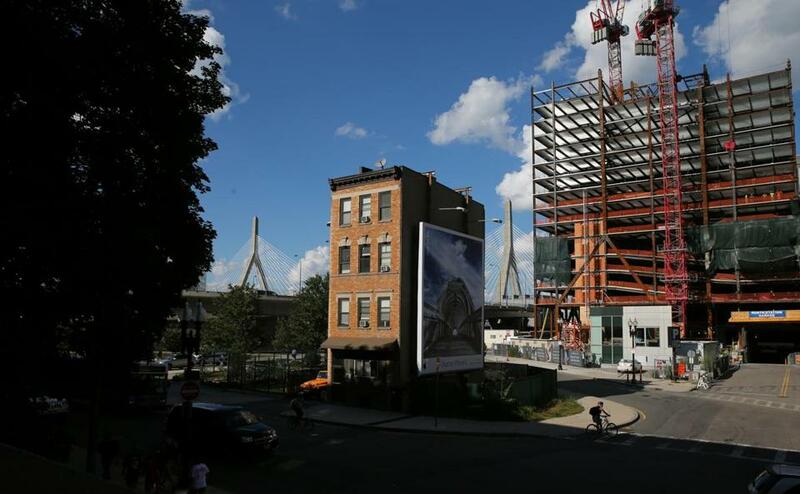 It is ringed by Big Dig ramps and surface roads, dwarfed by the TD Garden, the O’Neill federal building, and the high-rises of Charles River Park nearby. And now, closer still, a 38-story luxury tower rises in its backyard, the renderings showing a “sky lounge” and a first-floor arcade with a wine bar. Another tower, at 46 stories, has been proposed across the street. And yet the little building endures, a survivor of fire, urban decay, urban renewal, and gentrification, dodging the wrecking ball four times at least. “The lone ranger,” said Herb Shifres, who grew up nearby and whose cousins lived in the building after World War II. “The little house on the prairie,” said Anthony Cardinale, lawyer for late Mafia underboss Gennaro Angiulo, whose trusted associate, William “Skinny” Kazonis, once owned the building and lived upstairs. To a dwindling number of West Enders, 42 Lomasney is a brick-and-mortar reminder of the corned beef at Barney Sheff’s and the pickles at the National D, of worn-leather basketballs bounced by a settlement-house team managed by young Leonard Nimoy, of street-corner dandies with leather jackets and pocket combs. And of the death of the neighborhood. It is more than that, a silent witness to so much change, the stories of the building and its many residents mirroring the undulating history of the modern city itself. 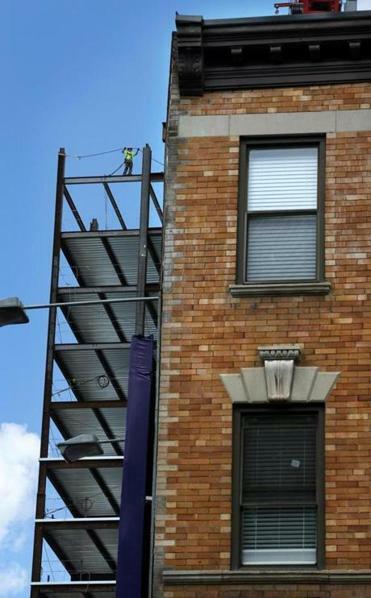 It watched the elevated train tracks go up, a mattress length from its third-floor windows, and it watched them come down — 92 years and millions of clattering trips in between. It was standing there in 1910 when a census taker found that 54 of the 87 mothers on this side of the block had buried at least one child; was there in ’28 when the old Boston Garden opened with rifle volleys and a boxing card; and still there in 2004 when an Illinois state senator named Obama electrified the Democratic National Convention next door. 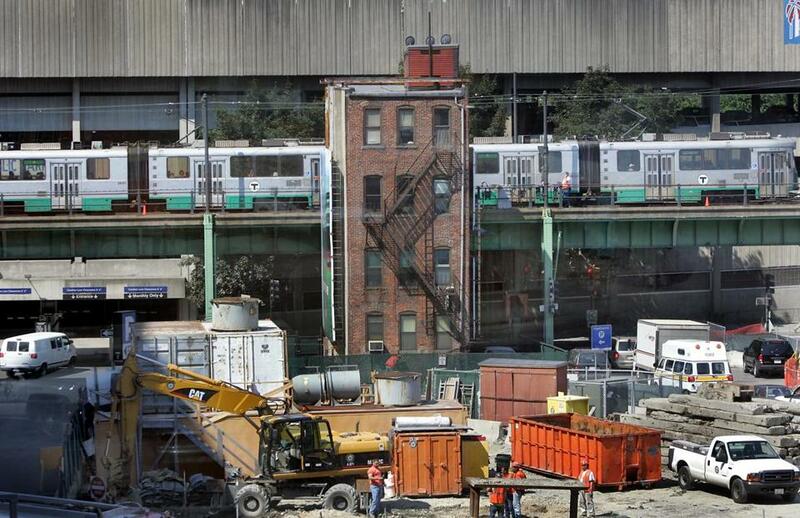 In June 2004, the last tenement in Boston was hemmed in by the MBTA’s Green Line on one side and a Big Dig staging area on the other. Even its billboards speak volumes, peddling Rolexes and Ketel One vodka and now the iPhone 6, in place of earlier ads for Pall Mall cigarettes and Natural Light beer. The lot it sits on, a mere 50th of an acre, was once part of a cove called the Mill Pond. That marsh was filled in the 1830s to build a depot for the state’s first railroad — connecting Boston and Lowell — and to sell house lots along some thematically named streets. That first house at 42 Lowell was probably smaller and made of wood. It traded hands a few times before George M. Rogers, a furniture dealer with a growing property portfolio, bought it in 1852. Rogers favored Yankees; one of his early listings restricted the rental to “an American family,” while another called for “a responsible man.” But he would end up renting to immigrants before his death in 1889; almost everyone in the West End would, with waves of desperate arrivals coming first from Ireland and Central Europe, then beyond. Boston’s population quadrupled between 1850 and 1900, and tenements — a blanket term for low-frills, walk-up apartment buildings — sprouted to squeeze them all in. This one probably went up in the 1870s, because the 1880 Census counted four immigrant families living at the address: two Irish, one English-Irish, and one German-Jewish, 20 people in all. 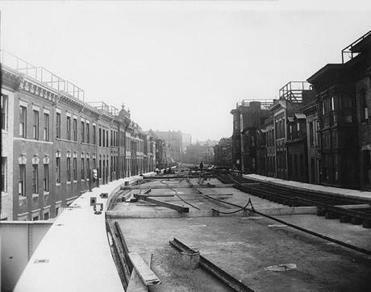 During construction of the West End’s elevated railway in September 1911 along what was then called Lowell Street, No. 42 was on the left, about midway down to Causeway Street, in this archival view. The building survived a kerosene stove flare-up on the second floor in 1892, and in 1905 a mysterious first-floor fire that filled the tenement with smoke at 1 a.m. The sleeping families might have perished if not for a gasfitter named Charles Gallagher, who smelled the acrid air while walking home from the nearby Hendricks Club — the social and political hangout of powerful ward boss Martin Lomasney — and pulled an alarm, then burst in to rouse the families. By the 1910 Census, there were 51 people living at 42 Lowell and the two tenements framing it on either side: 50 were Yiddish-speaking Jews from Russia’s Pale of Settlement; the 51st, Sing Lee, was a Chinese laundry worker. In a typical arrangement, shoemaker Abraham Tilkin, who had fled what’s now Belarus and ran a small shoe shop in Charlestown, squeezed into one apartment with his wife, their three young children, his mother, and his brother — less than 100 square feet per person. The Tilkins, like most of the families finding an early foothold in America here, would not stay at 42 Lowell long. But one family that arrived around 1918 would stay half a century: The Swietlikowskis. The first of this clan to move in were John, a Polish immigrant who picked up what hours he could at a rubber factory, his wife, Rose, who emigrated from a potato farm as a teenage bride, and their three children. They had a boarder, too. 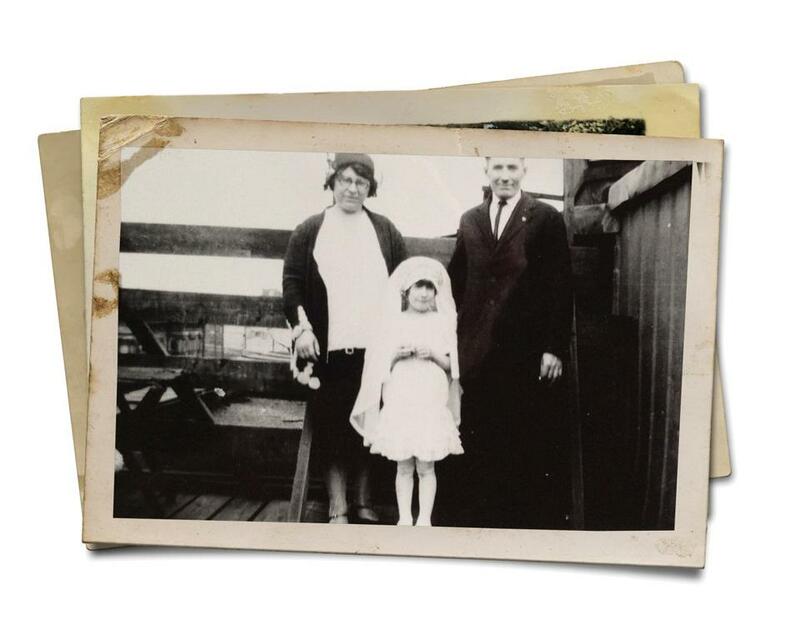 Now on its own in modern Boston, 42 Lomasney was home to waves of immigrant families, including Rose and John Swietlikowski, with daughter Helen. John was tall, slender, and gray-eyed, according to his World War I registration card; census records say he never went to school, relying on Rose to read and write. They eventually had seven kids, five who survived. Granddaughter Karen Ward, a retired medical researcher in Vermont, thinks one young uncle died of diphtheria, and another fell from a rooftop. The Swietlikowskis paid $16 a month for rent in 1930 and the same in 1940, equal to $273 today, no small sum at the Depression’s tail end. When John and his three oldest sons — all in their 20s, still home and helping the family survive — pooled their wages, they made $1,530 that year. Though John died in 1950, Rose stayed in the building with youngest son Teddy, an unmarried World War II veteran. Ward, nearing 60, remembers visiting “Babcia’s house” — grandmother, in Polish — as a girl, watching the trains go rattling by, seeing the laundry on a line out back, and perching on a stool with a Coke and popcorn as Uncle Teddy stopped in a bar to place a bet. All his friends had colorful nicknames — Ralph the Ox, Phil the Fish. “It was quite a neighborhood back then,” said Ward, who drives by whenever she is in Boston, relieved to see it still standing. The building was just as exotic to Alan Segal, whose grandfather, Max Kushner, had his sheet-metal shop on the first floor from the 1940s through the 1970s, his store windows filled now by concrete. A barrel-chested man who survived conscription into the czar’s army, Max specialized in making antique-looking sconces. Beat cops and workers from the nearby Registry of Motor Vehicles office often stopped in to say hi and share what Max called a “shnipik” of V.O. whiskey. Eventually, a couple of buildings on the north side came down for a small parking lot. More were sacrificed for a new cross street two doors to the south. That left 40 and 42 as a connected pair in a gapped row that still had most of its teeth. Then the wrecker claimed everything north of them on Lowell in the early 1950s, the tenements replaced by elevated ramps connecting Storrow Drive to the new Central Artery, hugging the back of North Station. It was a small taste of what would come next. Rising behind a worn corner of 42 Lomasney Way is a 38-story tower to be filled with luxury units, designed to include a “sky lounge” and a wine bar. The West End’s demise has been widely told: how leaders of a city hemorrhaging jobs and middle-class families to the suburbs leveled a crowded “slum” and handed 48 acres to a developer to start over, with little more than lip service for the displaced. Less remembered is that the eminent-domain letters blanketing the neighborhood in 1958 stopped at the elevated tracks, an impediment to redevelopment. That left a splinter of the West End along the east side of Lowell, soon to be renamed Lomasney, and two streets behind it, with some 50 tenements in all. In 1972, “Skinny” Kazonis, a low-level Mafia associate, bought two of those forlorn buildings (42 Lomasney and 23 Billerica) for a combined $20,000 from the heirs of George Rogers. Kazonis lived in the Lomasney tenement, but the tax bills, by some accounts, went instead to the North End office of Boston underboss Angiulo. Kazonis would serve time in the 1970s for loan-sharking and again in the 1980s for obstruction of justice, snared in the wider FBI operation targeting the Angiulo brothers. But Jim Campano, who publishes The West Ender newspaper for the neighborhood’s diaspora, remembers him as mild-mannered Skinny, who also ran a gas station. Though old-timers clung fast to this remaining patch of the West End, Mayor Kevin White considered it part of the blighted North Station area — marred by vacant storefronts, an adult theater, and the shuttered Hotel Madison. He lobbied hard in the early 1980s for the federal government to build a 3,000-employee office there, while the Boston Redevelopment Authority board approved eminent-domain powers over the buildings that still stood. But as plans for the new Thomas P. O’Neill Jr. Federal Building were finalized, a few tenements were allowed to remain. In 1990, preparing to dismantle the El and submerge the Green Line, the MBTA bought all but one, leaving 42 Lomasney standing alone. Some speculated that the Angiulo shroud protected it, but a T official said then that prices had simply climbed so high in the rebounding neighborhood — the agency paid $1.4 million for one-seventh of an acre on neighboring Billerica Street — that they had to proceed surgically. Meanwhile, Campano and others trying to start a West End museum coveted that last tenement, but didn’t have the money to land a deal. Campano said they all expected the Mass. Turnpike Authority to swoop in and poach it while building new ramps for the Big Dig, but when that project finished, 42 Lomasney remained. In 2001, Kazonis sold it to something called the Yensamol Realty Trust (“Lomasney” backwards) for less than $100 and continued living there. (His name remains on a faded sticker in the entryway, but Cardinale said Kazonis spends most of his time in Italy now.) In ’04, the tracks finally came down, bringing the building out of the shadows; it has attracted a growing following since then, pointed out by Boston Duck Tours drivers and featured in a print by a Somerville artist. Last summer, Yensamol sold the building for $1.5 million to the equally anonymous 42 Lomasney Way Realty Trust. Not long after, contractors gutted the units, and installed stainless-steel appliances and granite countertops. They left one 19th-century brick wall exposed inside — and 1970s carpeting on the walls of the shared entry. Last winter, the renovated one-bedroom apartments began appearing on short- and long-term rental sites for as little as $65 a day and as much as $3,000 a month, depending on whether the unit came furnished. Heath Properties, the new building manager, said the owner prefers anonymity but did not discourage tenants from talking about the building. One recent afternoon, Gary Roberts of Indiana answered the door at what used to be Max Kushner’s place, where his daughter was living while finishing a summer internship. Initially taken aback by her choice, he warmed to the building and Googled it to try to learn more. Down in the basement, 25-year-old Casey Claude has been paying half the going rate upstairs. A transportation planner who relocated from graduate school in Texas, she was just about to give up on finding an affordable place downtown when she spotted the Lomasney listing on an app called HotPads. She recognized the building immediately as a survivor of midcentury excesses in urban planning, an era that wiped out whole urban neighborhoods and produced massive highways to the suburbs. It broke her heart when she studied the period in school. Seeing 42 Lomasney standing all by itself, she was smitten.